This is us, both a very normal and a very special family. We come from the Netherlands, where we had a regular life. Now we intensely enjoy the richness and freedom that nature and the mountains gives us. We live according to the seasons, having our long winter sleep at night and warming ourselves near the stove, opening our hearts to nature’s richness in the springtime. Summer is really the peak season. One big feast with all the nice people who come to visit us. We gather fruits, chestnuts, mushrooms when most people have left again. The children run barefoot through the grass and at the end of a long day playing, they are just as muddy as our wild boar, Teddy. We enjoy the southern sun during daytime and in the evening sit around the campfire. The children swim in the river that runs alongside the house and learn to take care of the animals. Together we plough, sow then harvest our vegetables. We still are busy finishing the construction of the old Mas. The children learn from all that is happening around them and intensely enjoy the contact with all the inspiring visitors. With open hearts we listen to the stories of the guests and travellers. In the meantime they learn the foreign languages, learn their games, share toys, go on discovery tours and share a bath in the evening. 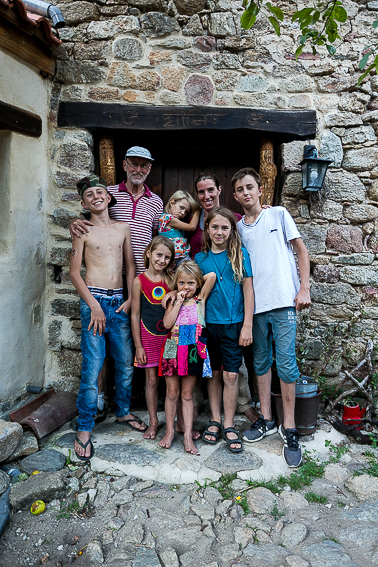 Young travellers are welcome to stay for a longer time to share our life and work. Our leading principle is trust and we eagerly advocate it. In high season we organise walks in the mountains for anybody who likes to join us and is fit enough. For the children there is a horse and donkey-ride and in the early morning we do meditation. We are looking forward to meeting you!